Zara Phillips has married Mike Tindall in a private ceremony at Canongate Kirk in Edinburgh. The bride and groom were beaming as they emerged from the church to cheers from the waiting crowds. Zara was radiant as she arrived to marry rugby star Mike at the Royal Mile venue this afternoon. The 30-year-old cousin of Prince William arrived five minutes late for her nuptials, but was relaxed and happy as she smiled for the cameras upon arrival. She was stunning in an ivory Stewart Parvin dress, with a short train and beautiful silk veil. The dress had a chevron pleated bodice, ending in inverted pleats on a dropped waist, creating a bell-shaped silhouette, and also included a concealed structured corset as well as silk tulle straps that fell into a V-shape at the back. Zara chose it from The White Room, a boutique in Minchinhampton in Gloucestershire, near where she already shares a home with her new husband. She carried a beautiful bouquet by Paul Thomas, shoes were by Jimmy Choo, and the exquisite Greek Key tiara loaned to her by Princess Anne was once owned by Princess Alice of Battenburg, the mother of Prince Philip, Duke of Edinburgh. Zara waved back to the crowd who were shouting and cheering at her, before the bride and her father were greeted by the Reverend Neil Gardner, and made their way inside. Earlier in the day, the royal family and a host of stars arrived for the nuptials. Coronation Street actress Katherine Kelly was the first to arrive, followed by rugby stars like Martin Johnson and Austin Healy, before members of the royal family, including the Duke and Duchess of Cambridge, and Princesses Beatrice and Eugenie, arrived. The newlyweds and guests will enjoy a reception at nearby Holyroodhouse, the monarch’s official Scottish home, where best man Iain Balshaw will give a speech. Kate Midleton, Duchess of Cambridge’s look was a wide-brimmed inside-out frilly floral number, complementing her cream jacquard coat perfectly. Thrifty Kate was recycling the coat, having last worn it in 2006 for the wedding of Laura Parker Bowles and Harry Lopes. 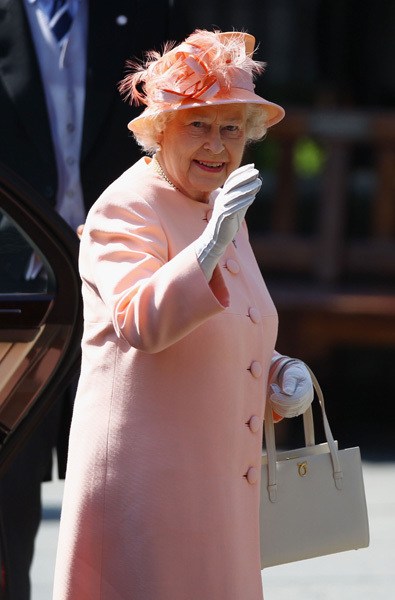 The Queen, who was dressed in Stewart Parvin like her granddaughter bride, chose a traditional hat with feathers that set off her lovely peach-hued outfit. Beatrice colour-matched her outfit with an asymmetric azure-blue dish-shaped fascinator that featured fabric flowers. After the ‘pretzel’ hat that she wore to Kate & Wills wedding, this turquoise hat has amused Twitter users, many saying it looked like a ‘satellite dish’. Perhaps she is tweeting with her fellow look alike aliens from space!?? Princess Eugenie completed her monochrome outfit with chocolate and white feathered frippery. Camilla, the Duchess of Cornwall, opted for oversized with an extravagant spray of white flowers. This entry was posted in current issues, entertainment, royals and tagged Canongate Kirk, edinburgh, kate middleton, mike, phillips, princess Anne, queens grand daughter, royal, rugby player, scotland, tindalls, wedding, will, william, Zara. Bookmark the permalink. I agree with your Zara Phillips Weds Mike Tindall | IT's My Thoughts, excellent post. I agree with your Zara Phillips Weds Mike Tindall | IT's My Thoughts, fantastic post.